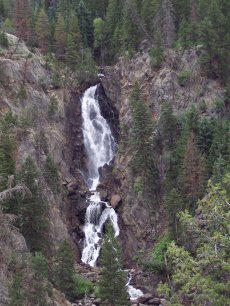 This Colorado waterfalls page will tell you everything you need to know to take a great waterfall hike. I'll tell you where they are, and give you specific directions to each trailhead. Then I'll tell you the distance of the trail as well as some of the scenery you might expect to see along the way. By the way, if you have some favorite waterfalls in Colorado, I'd love to hear about them. Please let me know about them here. Or, if you want to see what other people have said about their favorite waterfalls, go here instead. Some of these Colorado waterfalls require a fee in order to be seen, while others are free. Those are the best kind! I'll be telling you about both, but if they do require a fee, I'll tell you what the amount is so you can decide what you want to do. 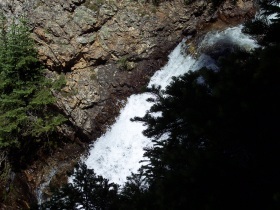 As you know, most Colorado waterfalls make great hiking destinations...otherwise you probably wouldn't be here. So, you'll probably be happy to know that they can be found in various parts of the state and that they come in all sizes and shapes. You probably won't have too much trouble finding one you like. O.K., are you ready to go see some Colorado waterfalls? Good, then I'll start you off at Rocky Mountain National Park. You'll find some good waterfall hikes there and the trails will range from easy to moderate. Here's the link to my Rocky Mountain National Park trails page and once there, just choose a hike that looks to your liking. Have fun! 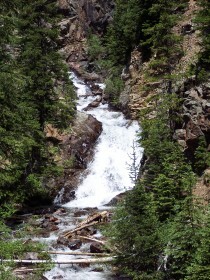 If you’re going to be in the Boulder area, you should put Boulder Falls on your “to do” list. It’s in Boulder Canyon and shouldn’t be missed. Seven Falls is a 181 foot waterfall in Colorado Springs. It has seven separate falls, and can be viewed from a platform that's 140 feet up off the ground. If you'll be in the Glenwood Springs area, you should do the hike up to Hanging Lake. You'll find a waterfall that drops into this turquoise-colored lake, as well as another waterfall that spouts out of a hole in the cliff, therefore having been given the name "Spouting Rock". Are you going to be in the Gunnison or Crested Butte areas? If so, you could go see Judd Falls. 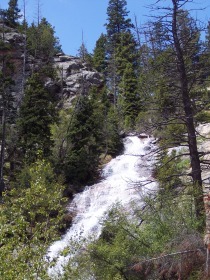 It's a short and fairly easy hike that takes you to an overlook of this pretty Colorado waterfall. Another waterfall you could go see if you're going to be in the Gunnison or Crested Butte areas is Chipeta Falls. And the unique thing about this one is that to see it, you have to take a ride in a boat. For more information about it, you can visit my Morrow Point Boat Tour page. My above page titled "Waterfalls in Colorado" now has plenty of waterfalls, so I'm starting yet another new waterfall page. 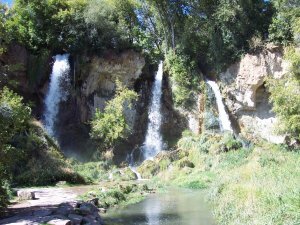 If you're interested in seeing it, then do visit my Colorado Waterfall Trails page. If you enjoy this site, and like the pictures you see here, you might be interested in helping us make it even better. I have opened a store called Colorado Nature Photos which features my best photographs; many of which you see on this site. My photos are displayed on mugs, coasters, prints and posters, among other things, and I plan to add more photographs as time permits. Each photo product that is sold will earn me a small royalty which will help us in our efforts towards this site. So feel free to visit my Colorado Nature Photos store and browse through it. Thank you so much :-). From the Denver area, take I-70 west to the Breckenridge exit 203. Follow Hwy. 9 south and drive through Frisco and on to Breckenridge. Breckenridge is about 9 miles south of Frisco on Hwy. 9. O.K., now on to this splendid Colorado waterfall known as Continental Falls. For about the first two miles of the trail, you're hiking through a pine scented forest, and at one point early on, you cross Spruce Creek. At another point, the trail leads to a dirt road. Turn left on the dirt road and follow it until you see the sign on your right saying Mohawk and Mayflower Lakes. Follow that sign and the trail on to Mayflower Lake. Near this small lake, you will see the remains of several old cabins, as well as meadows filled with wild flowers. Near this lake is also the turn-off point for Continental Falls. The sign for the falls is well marked and you will have to cross a log bridge over a fast moving stream. It may be difficult for some people since there is no hand rail. Just take your time. Remember when I said this trail is moderate to difficult? Well, this is where it becomes more difficult. The last mile of trail to this waterfall is steeper, the trail is harder to follow, and the elevation is higher. But please don't be put off! I'm just telling you these things so you know what to expect. As many people along the trail told us, it's worth it, and it was to us too! Here's a Colorado waterfall near Steamboat Springs. But let me first give you directions there. From the Denver area, take I-70 west to the Silverthorne exit 205. (Sign also says Steamboat Springs.) Turn right, (north), on Colorado Highway 9 to Kremmling. In Kremmling, turn left on U.S. 40 west and follow it to Steamboat Springs. One-way distance: 1/4 mile to bridge at base of the falls. 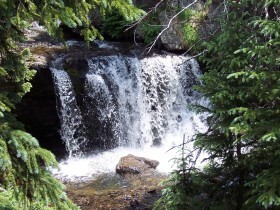 Directions to Fish Creek Falls trailhead: from Steamboat Springs, follow Hwy. 40 west, (Lincoln Ave.), to 3rd Street. Turn right on 3rd Street, then turn right again on Fish Creek Falls Rd. Follow Fish Creek Falls Rd. for approximately 4 miles until it ends in the parking area. The walk to this beautiful Colorado waterfall is short and easy. You have two choices: one, you can follow the paved trail which takes about five minutes and leads to an overlook of the falls. Or two, you can take the dirt hiking trail which goes downhill and leads to a bridge from which you have another good view of the falls. That's about a ten minute walk. Either way, you won't be disappointed. Do both! Some people consider this to be one of the best waterfalls in Colorado and I definitely agree. 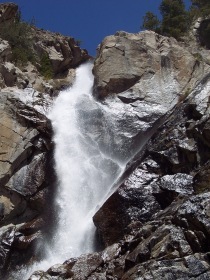 And if you're interested, you can also hike up to Upper Fish Creek Falls. It's 2.5 miles up the trail from the main Fish Creek Falls, and I think it's well worth going up there. Also, if you'd like to see a video of Fish Creek Falls, I think this is a good one. It was professionally done, and the link will take you to another website where you can enjoy it. Have fun :-). How about a triple waterfall? 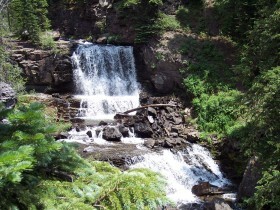 This one is located near the town of Rifle, Colorado, at Rifle Falls State Park. Here are the directions: take I-70 west to the Rifle exit, then go north on Colorado Hwy. 13 for three miles. Next, turn right onto Colorado 325 and drive 9.8 miles, where you'll see the sign for Rifle Falls State Park on your right. Turn right into the park. One-way distance-5 minute walk, or less. Dog friendly: yes, but dogs must be leashed. Entrance fee: $8.00 per day in 2019. This Colorado waterfall is unique since it's actually three separate waterfalls. From the small parking lot, just walk around the gate and follow the easy path to the falls. You'll hear them before you see them. Also, morning is the best time to be here since that's when the sun will be shining on the falls. (During the summer at least). If you brought a picnic, there are several tables near the falls for your use...have fun! 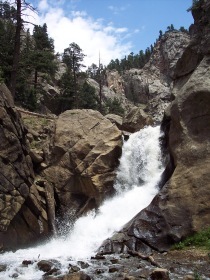 Helen Hunt Falls is near Colorado Springs and here are the directions to it: from I-25, take exit 141, (Hwy. 24 west), and turn left on 21st street. (21st becomes Cresta Blvd.) Then turn right onto Cheyenne Blvd. Stay on Cheyenne Blvd. and continue into Cheyenne Canon Park on North Cheyenne Canon Rd. until you see this Colorado waterfall on your left. This is a nice falls that’s worth seeing if you’re in the Colorado Springs area, but since you can drive to it, this will be a brief description of the short trail that goes up behind it, and up to the long slide of Silver Cascade Falls. It’s about .3 miles, (on a moderate trail), to Silver Cascade Falls and takes just over 10 minutes to hike up there. 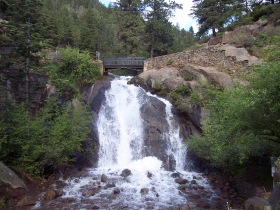 So, from Helen Hunt Falls, follow the trail that takes you up to the bridge and over Helen Hunt Falls. Beyond the bridge, the trail becomes steeper but there are stairs cut into it most of the way. Take your time and you should be fine. Directions to St. Mary’s Falls trailhead: from Helen Hunt Falls, (above), keep following the road upwards until you reach the end of the paved portion of the road. Park in the big dirt parking area. Then start walking on the closed portion of Gold Camp road which is on the far left as you drive in to the parking lot. You’ll walk for about 1.2 miles along the road until you reach the actual trailhead for this beautiful Colorado waterfall. (It's another 1.6 miles on the actual trail to the falls.) Unfortunately, it’s not marked so here’s how to find it: as you’re walking, you will come upon a closed tunnel with a big fence blocking the entrance. To the left of the tunnel is a narrow trail heading upwards and this is where you want to go. Shortly after this point, you’ll come to a fork in the trail and a sign saying St. Mary's Falls, which directs you to follow the right-hand fork. At some point beyond this, you'll come to another fork in the trail; this one un-marked. You can go either direction, since they both lead to the correct, main trail. After that, just keep following the trail upwards, and eventually, you'll reach a sign saying that St. Mary's Falls is .2 miles away. Now, even though you're almost there, don't think it's going to be easy-this is actually the beginning of the hardest part of the whole hike! So, keep working your way up towards this great Colorado waterfall, and soon you'll come to a fork in the trail. Although not marked, the trail that goes straight has been blocked off with a large log. You want to follow the sharp switchback around to the left. Keep on keeping on, (rest if you need to), and before long, you'll see the most difficult-to-reach waterfall of the many Colorado waterfalls that we've seen. Now, I’ll tell you briefly some of what you’ll see or hear along the trail since up to this point, I was trying to tell you how to find this breathtaking Colorado waterfall. Directions to Booth Falls trailhead: from the Denver area, follow I-70 west to east Vail at exit 180. Take exit 180 and as you come off of it, make an immediate right turn and then left onto Frontage road. From here, it’s a short drive to Booth Falls road where you want to make a right. Follow this road to the end of the road and the trailhead. There’s a small parking lot here and we counted about 18 spots so it’s best to be here early, especially on weekends. The trail to this hard-to-see, (and photograph), Colorado waterfall starts on the other side of the gate that you’ll see near the parking area. The first part of this trail is probably the steepest part of the whole hike. But after that, it becomes more moderate and stays that way for most of the way to the falls. The first half tends to be a little buggy, (but not bad), so I recommend the bug spray. Also, there are lots of aspen trees along this trail so it's great for fall color. The trail goes back and forth between open areas and trees, so there is usually a place to stop in the shade for a break. Along the way, you’ll cross a creek twice and stepping stones have been placed there so you can more or less get across without getting your feet wet. At about the ¾ mark of your hike, you’ll come to a fork in the trail and there’s no sign there telling you which way to go. You want to take the right fork. Shortly after this, you’ll be hiking up a relatively steep stream bed that might have water in it. From here though, it’s not far to the falls. Once there, you’ll see why it’s hard to see the falls but there’s also an upper falls which I think is very pretty. Directions to Lake Irwin waterfalls: from Gunnison, follow Hwy. 135 north to Crested Butte. (It’s about a half hour drive.) In Crested Butte, turn left onto Whiterock Ave. which becomes Kebler Pass Rd. Follow this road about 6 miles to the Lake Irwin turnoff on your right. Turn right here and drive about 2 more miles to Lake Irwin. Once there, follow the road over the lake’s spillway and turn left into the tiny parking area that fits maybe 2-3 cars. (If there’s no room there, you can park in the bigger lot on the other side of the road.) There is no sign for these two Colorado waterfalls but the narrow trail starts from the smaller parking area. Follow the trail down along the river and within a few minutes, you’ll see the first waterfall. Just a short ways beyond that, (and a few more minutes), is the second waterfall. Enjoy, and when you’re ready, go back the way you came. Directions to Hays Creek Falls: in Carbondale, follow Hwy. 133 south to Redstone. From Redstone, it’s then about another 1.8 miles south on Hwy. 133. You’ll see the sign for Hays Creek Falls on the right, (west), side of the road. This Colorado waterfall is only a few minutes from the road but even so, I was wishing I had worn my hiking boots when I was there. You have to hike over uneven terrain to reach the falls and that includes a fairly large slab of rock which tilts downwards. So, watch your footing and you should be just fine. At the trailhead, parking is on the side of the road, so just park wherever you can. As always, it’s best to arrive as early as you can. This is especially true here since this Colorado waterfall is situated in an open area that could be dangerous during a thunderstorm. 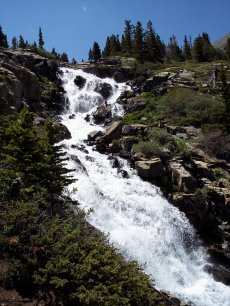 Although the roundtrip distance to Quandary Falls is fairly short, the hike is a little more difficult than you might think. 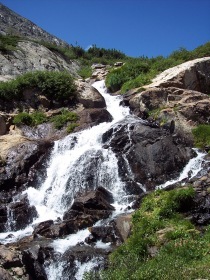 Some sections of the trail are steep, there are several rock fields to cross, and this Colorado waterfall is one of the highest elevation hikes on this website. Still, if you can handle the elevation, I think it’s well worth going to the falls. Anyway, the trail starts on the other side of the gate and follows an old road. It’s rocky but eventually turns into a regular trail. You’ll go through wooded areas and a few open areas. As I mentioned earlier, you will also pass through several rock fields but they are relatively short. The last section of the trail becomes more difficult because the trail is steeper and the elevation is higher. At one point you’ll reach a long, large slab of rock. 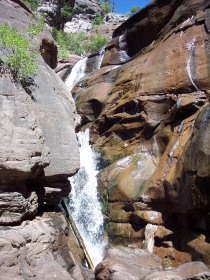 Hike up this rock to follow the trail and then it’s not much further to this pretty Colorado waterfall. Be watching for a little spur trail that goes left and this will be the path to Quandary Falls. Please note: the trail to Agnes Vaille Falls is currently closed at least until the spring of 2014 because of the rock slide tragedy that happened here in the fall of 2013. July 2, 2014 update: we happened to be driving by the turn-off for Agnes Vaille Falls two days ago on June 30, so we decided to drive down there to see what we could find out. There was a "do not enter" road sign at the entrance to the trailhead, and the entrance was also blocked by two concrete jersey barriers. In addition to this, the sign for Agnes Vaille Falls was gone, so it's not looking very promising that the trail will re-open any time soon, if at all. I will let you know if I find out anything new. Directions to Agnes Vaille Falls trailhead: from the Denver area, follow Hwy. 285 south, all the way to the small town of Nathrop. (It’s about 8 miles beyond Buena Vista.) In Nathrop, continue south on Hwy. 285 for another .3 miles, then turn right, (west), onto County Road 162. From there, it’s a little over 8 miles to the trailhead on your right. It’s well marked with a sign saying Agnes Vaille Falls trailhead. We estimated that the parking lot for this Colorado waterfall could hold maybe 10 cars, so again, the earlier you can get there, the better. By the way, we saw a pronghorn antelope and several deer as we were driving along County Road 162 to the trailhead, so keep an eye out for them! Anyway, the trail to this Colorado waterfall is rocky but starts out fairly easily otherwise. You’ll be hiking through a forest for the most part and after a short time, you’ll come to the first of two benches. Take a break if you want to, and when you’re ready, continue on the trail which now becomes more moderate. After a short time, you’ll reach the creek and this is where the trail starts to get more difficult. In some spots, the trail becomes quite narrow and you’ll be hiking right next to the creek. There are a couple of places where you have to climb over rocks, so just take your time. You’ll be there in no time and when you are, make use of those rocks, and find one to sit on and take in the view. Anyway, I hope you enjoy visiting these Colorado waterfalls as much as I have. And if so, please read on and let me know what some of your favorites are. What are your favorite Colorado waterfalls? What are some of your favorite waterfalls in Colorado, and what would you like to say about them? Or, would you like to leave a trail review for any Colorado waterfall that you've seen? If so, feel free to do that in the below form. Thanks very much :-). Also, please note that the maximum image size that can be accepted is 800x600 pixels. Click on the links below to see what other visitors have said about their favorite Colorado waterfalls...then tell us about your own favorites :-). Bridal Veil Falls, Telluride Colorado! Largest waterfall in the state! Breath taking!!! Breath taking!! You can also hike up to the top. Many caves along the way. Return from Colorado Waterfalls to Colorado Hiking Vacations home page.